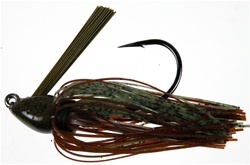 Phenix flipping jigs are designed for fishing shallow water cover with heavy line. It's perfect for any scenario whether it's grass, wood, rock or docks. The slender head design is specific sliding through cover and skipping docks. The hook features a round bend heavy wire model to allow for a greater hook up ratio and strength for pulling fish out of heavy cover. We recommend a heavy action rod with 20lb Fluorocarbon line. Look for any shallow cover and go to work.